A palatable muesli mix which is suitable for broodmares in the last three months of pregnancy and during lactation. Ideal for young foals in their first year and for growing youngstock. Also suitable for working stallions. 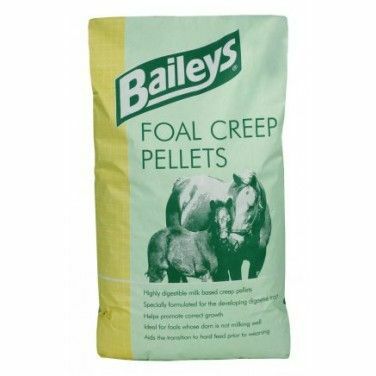 Baileys Foal Creep Pellets is a highly digestible milk based feed designed for foals whose dam is not milking well or to top up the nutrients from a milk supply. Because they are barley-free, stud Cubes are non-heating and a lower starch alternative to Stud Mix so are the preferred choice for horses with a tendency to excitability. Baileys Prep Mix has been developed to match the nutritional requirements of young stock which are being prepared for the sales or show ring. 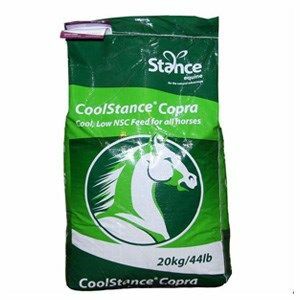 Coolstance Copra is a unique horse feed because it has low Non Structural Carbohydrate (NSC), and yet has a high digestible energy content. A powdered milk replacer for orphan foals or foals whose dams produce insufficient milk. Nutritionally balanced muesli for Warmblood, Native & Part-Bred broodmares, stallions & youngstock (1-3yrs). Nutritionally balanced cubes for Thoroughbred broodmares & stallions. Dodson & Horrell Yearling Cubes are designed for growing Thoroughbreds that require condition. Yearling Cubes contain elevated minerals and vitamins for optimum growth of your yearling. Equerry Stud & Yearling Mix is a feed designed for broodmares, young stock & stallions which require a high protein diet to support pregnancy, growth & muscle maintenance. Gain Stud Cubes are energy dense, highly digestible, palatable cubes ideal for maintaining condition. They provide concentrated nutrition when the foal growth restricts intake in late pregnancy. Gain Stud Mix is similar in specification to the Stud Cubes, Stud Mix is suitable for all types of breeding stock from broodmares in pregnancy and lactation, stallions, foals, weanlings and yearlings. Gain Yearling Cubes are quality protein sources that provide the ideal amino acid balance for growth. Yearling Cubes are ideal for yearlings needing more condition. Gain Young Stock Mix is a very palatable muesli containing highly digestible cereals, quality proteins and an excellent trace mineral and vitamin specification. Heygates Stud Mix is a lightly molassed coarse mixture built to the same specifications as the stud nuts. This is a high energy, high protein food for pregnant and lactating mares, foals, yearlings and stallions. Heygates Stud Nuts is a high energy, high protein nut for pregnant and lactating mares, foals, yearlings and stallions. Hilight Stud Mix is a palatable and digestible mix with oats for pregnant and lactating mares and youngstock. A palatable and digestible non-heating cube for pregnant and lactating mares and youngstock. Keyflow Nurture® PRO Pre-digested Stud Balancer designed to support and balance the diet of stud horses kept at grass (stallions, mares and foals and youngstock). Red Mills Foal & Yearling Cooked Mix 18% are a steam-cooked and flaked alternative to our long established Foal Pellets and Yearling Cubes. Red Mills Stud Cubes 14% are a fully balanced ration for broodmares and stallions for optimum fertility and health. Red Mills Stud Mix14% are a fully balanced ration for broodmares and stallions for optimum fertility and health. 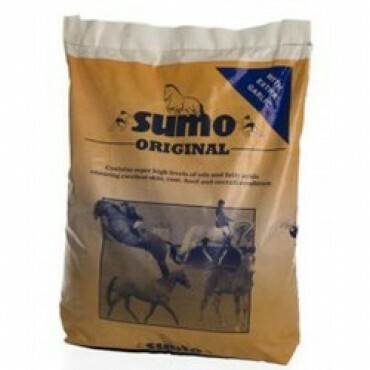 Sumo Original is an extremely valuable feed for all horses from youngsters to veterans, especially when trying to perfect the condition and enrich the bloom in the coat. Saracen Level Grow Mix uses a unique blend of ingredients for alternative energy sources that produce a minimal glycemic response after digestion. Saracen Level-Grow Pencils are ideally used as a foal creep feed but is also useful for backward foals, lactating mares, larger broodmares & maintain weanling's & yearlings up to three years old. Saracen Mare-Care is a great way of controlling body condition of mares throughout gestation by meeting their specific nutritional requirements. Saracen Stamm 30 Balancer is designed for horses in work, mature horses that need more protein or fast growing foals to help control their weight gain & growth rates. Saracen Stud Prep 14 is a nutritionally dense diet designed for sales preparation, showing & for mares during lactation. Spillers Stud & Youngstock Mix is suitable for youngstock between 6 and 24 months, pregnant or lactating mares and stallions. Spillers Stud Cubes are suitable for youngstock between 6 and 24 months, pregnant or lactating mares and stallions. Contains ideal sources of protein to support demands during pregnancy and growth. Spillers Youngstock Pellets are suitable for growing horses or ponies from 2 weeks to 2 years of age. Carefully controlled levels of cereal starch and sugar will help promote positive behaviour. TopSpec Stud Lite Feed Balancer is a very palatable ‘Non-Heating’ low calorie feed that contains a multisupplement including the levels of micronutrients and digestive aids normally only found in supplements.